Next Size 5 Gold Stiletto Ankle Boots . Condition is Used. Dispatched with Royal Mail 2nd Class. These are in very good condition. Only tried on indoors never worn outside. Suede effect shoe boot with peep toe front, cut out side back panels with strap and buckle. Tan cushion linings and black soles. Blue real suede leather high heel ankle boots from Next with rear zip fastening. Next Ladies Shoe Boots Size 4. Condition is Used. In excellent condition with no marks or defects. The material is mainly leather with suede across front and zip detail, dispatch with Royal Mail 2nd Class. They look a little out of shape which is due to storage and straighten out when on. Stiletto heel. Zip fastening. Size 5 dark blue Leather ankle boot. Next stilletto ankle boots in black with high heels. Never worn. Beautiful boots but I'd avoid wearing them in the rain! Ladies Next Leopard Print Ankle Boots Size 6. Condition is Used. Dispatched with Royal Mail 2nd Class. Womens leopard ankle boots. size 7 Next. Worn twice so as new. Condition is Used. Dispatched with Royal Mail 2nd Class. Lace up at the front and side zip. A worn excellently Ladies Women FINE ITALIAN COLLECTION NEXT,Ankle boots in a good condition. ,Leather upper and leather lining. Synthetic sole. Black and grey colour design. Zip fastening. Mid stiletto sole, Pointed toe design. UK 4 EUR 37. Condition is Used. Got signs of worn before scratch @ toe,as shown in pictures. Very fashionable. Womens Next Black Mid ‘dealer’ Boots Size 6.5UK. Please check out my other auctions as I’m having a huge clear out and can combine postage if you win multiple items! Good luck! THIS IS A PAIR OF BLACK SUEDE LEATHER BOOTS BY NEXT. THEY HAVE BEEN WORN BUT NOT OFTEN OR EXCESSIVELY AND ARE IN VERY GOOD CONDITION. STILL VERY CLEAN AND TIDY INSIDE AND OUT. THE LENGTH OF THE LEG IS 10" AND THE WIDTH AROUND THE TOP IS 14". Next ankle shoe boots. Black mock glitter finish, size 6. High heels stiletto. Side zip fastening. Used but in great condition. Thanks for looking. Please see my other listings. Stunning Next Black Stiletto Trouser Shoes. PIXIE BOOT. MINT CONDITION, WORN ONCE FOR A WEDDING. SIZE 6.5 THOUGH I USUALLY WEAR A 7 THESE FITTED NICELY. BNWOT Next Runway Collection Black Faux Snakeskin High Heel Ankle Boots Size 6/EU39. Funky pair of black faux snakeskin ankle boots from Next Runway Collection – with purple soles. Back zip fastening. Snakeskin Style Leather Uppers. Stiletto High Heels. Inside Zip Fasten. Lovely Next Black Ankle Boots. Lace Up Detail To Back Of Foot. Ladies Next shoe boots size 3.5. Mock croc design. New never worn. Ladies Next shoe boots size 3.5. Mock croc design. New, never worn. Dispatched with Royal Mail 2nd Class. KNEE BOOTS. TINY SCUFF TO FRONT TOE. BLACK LEATHER. SZ UK 4/37. 17.5" INCLUDES HEELS. NO NEED TO WAIT. Size 5 black faux suede from NEXT. Damage to heel bottoms. They will need a new heel rubber. Excellent like new condition only worn once, . From a pet and smoke free home. Thanks for looking any questions please ask. Mid Calf Boots. Fastening - Pull On. Size UK 7 EUR 41. Circumference of Top of Boot - 38 cm. Platform Sole - n/a. Heel Type - Stiletto. Height from Floor to Top of Boot - 44 cm. Heel Height - 3". Ladies NEXT Kneehigh Boots bnib. size 3.5 never worn. Beautiful zip front style. Ladies NEXT Kneehigh Boots bnib. size 3.5 £99 new, never worn Beautiful zip front style.. Condition is New with box. Dispatched with Royal Mail 2nd Class. (Fantastic colours. Really comfortable and tight fit, clean and stain free. Uppers- No scuffing, suede unmarked. I try to describe the shoes honestly and credibly and photo any wear and tear so there are no shocks for anyone :). Next Stiletto Heel Ankle Boots Black Side Zip Metal Buckle Detail Size 5. Condition is Used. Dispatched with eBay delivery – Shutl 2-3 days. SIZE ~ UK 3 & EU 35.5. 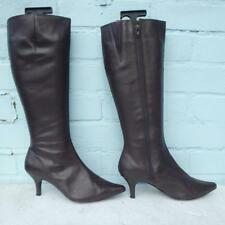 The boots are made from a brown/grey colour leather with a 3.5" stiletto heel. Next pull on knee high boots, size 5. Next Khaki High Heeled Boots Size 6.5. Dispatched with Other Courier (3 to 5 days). Size UK 7 EU 41.